Are you looking for river rafting adventures? 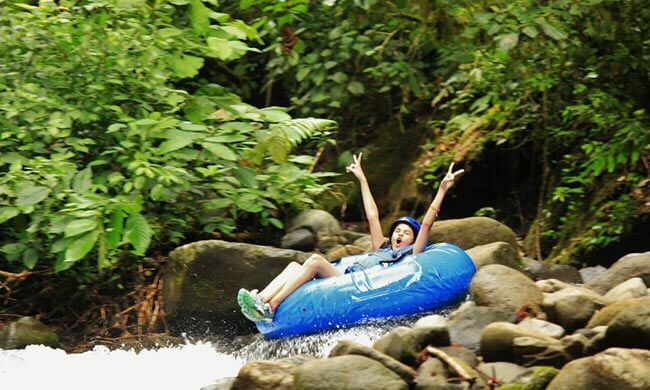 Sky River Drift Adventure is one of the newest attractions at the Sky Adventures theme park in Arenal! You will start the adventure on three carbon fiber cables that eventually bring you to a huge tree platform. From here, you will descend to a natural river pond below using a hands-free controlled device. Once at the river bank, you’ll board an individual raft and start your way down Piedras Negras (Black Stone) river rapids. A series of fast rapids with curves and small drops that will get your adrenaline pumping! A trained guide will be with you the entire time to provide assistance and ensure your safety. There are also a few short paths along the river in which you can enjoy the rainforest. Restrictions: No sandals or bare feet are allowed for the tour; maximum weight 216 lbs; minimum height 4’7”; maximum waist size 46 inches. What to bring: Enclosed footwear (suitable for hiking and water activities), comfortable clothing, suitable for aquatic activity, change of clothes. What’s included: All equipment, safety lesson, bilingual guide.